When you return to the Mushroom Kingdom after the Marrymore fiasco, talk to the boy sitting in the corner of the Inn. You can buy his GameBoy and the only game he has for it (Beetle Mania) for 500 coins. Press X and bring up the Menu Screen. Then, hold L and R and press the control pad in different directoins. The background Moves! Let up L and R when you've got a direction you like, and save the game. The background will always be like that untill you change it again! "ALL FEAR ONE AND ONE FEAR ALL!" The fireworks that a man in Moleville sells have a purpose. After the credits and ending scene, a large display of fireworks takes place. Depending on how many you bought during the game, the biggest firework will be a Mushroom, Flower, or Star. If you bought anywhere from 0 to 2, you'll get a Mushroom. 3 or 4 will get you a Flower. 5 or more will get you a Star! Need into the casino? You must first win 10 times against Knife Guy in Booster Tower (See Booster Tower below.) Then, go to Bean Valley, the area with the many pipes, drop down the one shown, and jump three times in the corner shown to make the block appear...grating you access. Mushroom Kingdom: Walk around the first house on the left as your comeing from Mushroom Way. On the side facing the castle, you should run into an invisible being of some sort. Throughout the game he will give you tips that might help you, untill Star Hill atleast. Rose Town 1: Hiding behind the house with the Button and two Threasure Chests is another Invisible helper like the one in the Mushroom Kingdom. Talk to him before Bowyer's dead and he will just tell you to go away. But, afterwards he'll tell you about The Goomba Thumping game and Yo'ster Isle. Who needs the Mushrooms that heal HP and FP? Everyone. But, sometimes you need them and they're nowhere to be found. If you have a Flower Tab, Box, or Jar and afew remaning Flower Points, you're in luck! Use Mallow's HP Rain or any other healing spell untill everyone is fully healed. Then, use the Flower thing and your FP will be replenished. Good as new! The Lazy Shell weapon and armor are the most powerful items you can buy...well, find. First, after you "whack Smilax" in Bean Valley, you spot a note dropping down. Read it and take the seed. Next, after Valentina is vanquished from Nimbus Land, head to the SE edge of town and run along that edge. Up near the house that is built into the castle is a walkway out into thin air. Follow that and you'll find the Shy Away. In fear, it will give you the Fertalizer. Finnally, head to Rose Town. Behind the store there should be a path leading to the Gardner's house. Give both items to the excitable gardner and he will immidiatly use then. A vine will grow immidiatly from his planter and rise into the sky. Climb that vine up to reach the two chests that contain the Lazy Shell. Equip the Armor to Toadstool for an almost-impossible-to-kill healer, and give Mario the Weapon. No armor or weapon is better for those two. The "Lazy Shell Effect", mentioned on this site afew times, is an item's ability to block all status changes, which the Lazy Shell can do. The spinning flowers you find around the world have a useless secret: if you stay on them through 5 spins Mairo will get dizzy and fall off. Jump to continue. This is actually the lesser known of the Samus Cameos, but it comes in the game first. 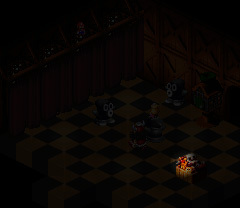 Head to Booster Tower (anytime) and enter the room where you do the curtain game. In the chest of toys (illuminated in the screenshot) is Samus! This cameo is often debated on how to see it. Although these may not be the exact times to see Samus, it always works. 1. During Mack's reign of the Kingdom, you can get a Flower Tab from the following people if you save them from the Shysters: Toad (say "You Bet" when he asks if the Kingdom's safe with Mario), and the people in the house mentioned in number 1. 2. Don't give the wallet you get from Croco back to the guy who's missing it when you return to find the Kingdom taken over by Shysters. If you do give it to you, the guy will find a measly Frog Coin in the wallet and give it to you. Instead, wait till after Star Hill and give it to him. Come back later and It will be a Flower Jar! However, if you wait too long, he won't give you anything! 3. Before Mack takes over the Kingdom, go into Toadstool's room and walk to the far side. Just to the right of the fireplace is a white section on the wall. Talk to it. You'll find Toadstool's ???. Don't ask what it is, cause I don't know. Toadstool's grandma will rush up and tell you to put it back in exchange for a Mushroom. You have no choice but to give it back. 4. That girl that wants to get "hitched" to Mario in afew years has a strange, and pointless, secret about her. Jump onto her head and ride her around (not meant to be sick) for about ten seconds. You'll be so dizzy from the ride, you'll fall off and lie flat on your face! Submitted by SJ64. 1. When you reach the room with a save point, three ghosts, a pipe, and a Treasure Chest high above on an archway, save. Then, walk up to the wall (edge of the room, which is just black) between the Pipe and the Archways. Jump continuosly untill a ghost appears below your feet. Run away and the ghost will become a stepping stone. Carefully jump over and get the box, which contains a Flower. Later, when you reach Land's End, the chest contains some Cricket Jam (drooling yet?). While you're up there, drop down the pipe to visit a place you normally wouldn't see for along time. What ever you do, try not to battle the Shyaway floating overhead; he's the hardness of normal baddies--from Land's End. To you on your first visit to the Sewers, these guys are harder than Culex (see below) is! They will only give you about 11 exp., so don't bother. 1. In the second area there will be a Lakitu. He will be dangaling a Shy-Guy on a fising pole. You can't reach Lakitu, but you can grab the Shy-Guys. After you attack and destroy about 5 of them, Lakitu will toss down a Mushroom and high-tail it out of there. 1. Before you defeat Bowyer, take a rest in the Inn. Toad will appear at your bedside and hand you a Flower Tab if you talk to him. 2. On your first visit to Rose Town, go up to the house where the guy's wanting you to go inside a press the button. Just jump up and grab the two trasure chests, and the invisible one on the bed. Then go into the Forest Maze and go left, left, strait, right (Mario's directions) at the four paths and go down the stump. Then go off and defeat Bowyer, then return to the guy and press the button. Tell him you took the treasurs when he asks and he'll give you a frog coin. 3. If Mario gets hit with an arrow (it is possible) he simply shows that shocked expression of his for a moment then resumes moving. 4. This one's more odd than a secret. Arrows are flying at the town of Rose Town. And they're hitting people. One thing that might help is if they wear hats. Haven't you noticed that their heads look just like big Bull's Eyes!?! 1. The yellow Wrigglers hold a secret: if you can jump consecutivly on them 10 times, you will get 9 coins and a frog coin! 1. In the room with 5 different pipes, excluding the one you came up, drop down the closest one from you. Stand about one block away from the ledge overhead. Jump, and a block will appear. Jump up and run to the box at the end. Grab it and walk back three steps and jump. Invisible block! Walk back 3 more steps and jump again. 'Nother one! Now, drop down and run to grab all those yellow coins. Then, press down at the last momement to slide under the ledge and grab that one frog coin. 1. If you're able to defeat Boshi in a 101 race (no easy task), you'll be able to start betting on the Yoshi Races! However, you can only bet on Yoshi. The Cookies you can win can be used as items. The Yoshi Cookie can be used to transform enemies into items! (See the enemy list.) Also, one of the Yoshis will hold up to 200 Cookies if you don't have room. 2. The little baby Yoshi can be fed. If you feed it too much, it will grow to be the size of Mario! If you feed him Cookies after he's fat, you can get items like Red Essence, Royal Syrup, and even the Rarest item in the game (this is the only place to get it): Yoshi Ade!!!! 3. Do you want to make alot of Cookies in the Mushroom Derby but can never hold onto your cookies? Get 3 from the Yoshi and save your game at the save block nearby. Now, I recommend having space for 10 cookies, but any amout is fine. Go place a bet on Yoshi and watch the race. If you win, store the cookies and then save the game and bet again. If you loose, hit that reset button and try again! Save when you win, reset when you loose. You'll always have the cookies you win, and you can still loose without depleting your supply! The Luckey Jewel will cause the Yoshi Shell game after the battle to appear, but only ten or so times. The Mystery Egg can be used on Princess (she must have the B'Tub Ring) 10 times to get 'Lambs Lure'. 48 Uses of that item will get you Sheep Attack. And last but definetly not least, the Metal Plate is the Princess's most powerful weapon. It can only be gotten after Barrel Volcano. 3. When you're chasing Croco, you can get 3 free Flower Tabs. Once Croco starts running without his minions, start looking! One is hidden behind a crate in the second room after he is first alone. The second one is behind the Trampoline, and the last is in the next room behind a stack of crates. 1. Enter the level when coming from Moleville. See the two bushes to Mario's right? Talk to the one that is farthest away. You'll get a Frog Coin! 2. In the second room of the pass, don't go up. Walk on the right side down blow and grab the flower (+1FP) and then walk into the small opening in the cliffs. Walk untill you stop, then jump around. You'll hit a switch that fills in the holes above and defeats the Spikesters. 3. When you hit a switch in Booster's Tower, a path on the far left side of the first room opens up. There you'll face the Aprentice. If you let him defeat you, you won't have a game over, the guy will just become a Sniffit! (It doesn't affect the curtin game or Booster Hill) If you come back there will be another one there, and if you let him defeat you again, he will also become a Snifit! Booster wants up to 7 Snifits, but then there's one Aprentice that defeats you that will stand in the corner pouting, for he doesn't get to become a Snifit. 1. The teeter totter in the room behind the front desk is very useful. If you walk up part of the tower you will find a path leading back into that room...only you're really high up. Jump down and onto the Totter (not the Bomb-Omb) and you will be hurtled back up. You'll get the Masher from the box above. That weapon is Mario's most powerful weapon up untill after Seaside town is Saved! 2. Remeber Booster's three Snifits? You can battle them each one your own. The first one his behind the front desk. Touch him and you'll enter battle. The second one is in the room where you first meet Booster on his railway. Follow Booster into the nitch in the wall to meet #2. #3 is the one shooting bullets at you about halfway up the tower. They don't give you much expirience points, only one to be exact. 4. Pipe Vault took you back to the side-scrolling world of the old Mario Games, but Booster's Tower takes you back to the flat graphics of the original Super Mario Bros. In the room with a large pole and two curtins, walk behind them to be transformed into the NES version of Mario! You can't do much, just jump and walk around in this one room. Try to leave the room to turn back to normal. 6. After you beat the tower, return to find Knife Guy. Play his ball tossing game and win 12 times. He takes off one point for every miss. If you do it, you'll get the Bright Card, which will get you into Great Guy's . 1. Remeber that bright card you won from Knife Guy? You can sell it to a man for up to 10 frog coins. You can get it back, but it will cost you 15 FROG COINS!! 4. After you save Toadstool from Booster's insane hands, try walking out the path to your (not Mario's) left just as you leave the wedding chapal. Everyone in your party trys to accuse you of kidnapping the princess! ;) Submitted by SJ64. 1. If you try to stay at the Inn without having enough coins, the Inn Keeper will be nice enough to give you the room. If you go there without any money, you can still get the room. 2. When Yaridovich asks for the Star, give it to him ASAP (gasp!). In the end, the real elder will give you a flower box. If you don't give it up, the prize will diminish in value each time you refuse. 1. In case you actually need this, the password is PEARLS. 2. Two of the most useful Accessories are found in the sunken ship. In the room with the first save point after King Calamari is the first one. The second treasure box contains a monster. If you defeat him, he'll give up the Saftey Badge. The second (and more powerful) one is in the room with the Blooper & Kids. Walk along the northern barrles counter-clockwise to get to a hidden door. Open it to find the Saftey Ring. 3. In the first room with Rats running up and down the stairs, jump behind the boxes (that little space) to recive a Flower! 1. The ants in the desert are a great source of money. If you jump on them, they'll give up a 10 coin coin! Jump again before they drop down and you'll get another 10! Once more will get you a frog coin. Try to hit them 3 times without touching the ground, it's the surest way to Gold (and Green). 2. After you complete the desert and are in the caves, remove ALL armor/acessories/weapons from your battling 3. Then save. Also, make sure you have 400 or more coins. (If not, just go up and jump on the ants.) Now, jump down and grab the treasure box. It's a star, so run like crazy and kill every enemy you find! Finnaly, drop down into the room with hundreds of Geckits. See the crates in the corner? Drop behind there and talk to the shaman. Buy his star and smack all the geckits! Finnaly, go through the temple and let Belome defeat you. Your back at the save point--with all the expirience points (about 300) you just got, and the stars are still there! 2. If you run and jump on the Belome, you can be ontop of him as he "licks" you and jumps in the air. 2. The key over one house in Monstro Town is impossible to jump up to, no matter how hard you try. So, enter the house below it and talk to the Thomp 5 or 6 times, and the Key will fall down where you can get it. Talk too much and it will fall off the cliff and be unrecoverable!! This key is for the Golden Belome that you see when you go down the elevator when the scroll says "Sorry, it's past my bedtime." 3. Talk to the Rat Funk in the second floor of Monster Mama's house to gain access to the Gardner's House in Rose Town. 1. In the area with five pipes and a save box, drop down the one farthest to the right (Your right, forget about the 3Dish perspective). Walk up and into the corner under the walkway above. Jump and you'll find a hidden frog coin! 1. A great item can be found here: the Star Egg. This item does 100+ HP damage on everyone! Best of all, it can be used as many times as you want! The bad thing is, it takes a long time to get. Enter the casion and start talking to Great Guy untill he asks if you want to play "Look the Other Way". Do so and then start playing. Might as well sit back, for this is going to take awhile. You need to win 100 times in order to get the Star Egg. However, GG doesen't count off losses. 2. After you defeat Valentina, walk over to the far right side of the town and start walking along the wall (Walking into it constantly). Eventually, you'll find an invisible walkway near the house facing off to the right by the castle. Walk out to the end to find Valantina's Shyaway. She'll give you the needed fertalizer so you can get the Lazy Shells from the Gardner's house. 3. After Birdo says "Get'em them while they're hot!" you can put yourself into defense mode and block the single eggs she shoots. They will flip up and become "Eggbert". They won't attack you, but if you defeat them the'll pop and do 80 HP damage to Birdo! 1. Look at the lava pit in the second room of the volcano closely. There are small stepping stones on the lower portion! Jump across them to get 2 Flowers! 2. In the room where you see a Frog Coin on the upper arch, go on through to the next room. Then turn around and go back. Jump in the lava and the coin is your's! 1. In the room where you meet Croco for the first time, walk behind the arches and to the left. Inside a hidden room is an HP & FP replenishing Mushroom and 100 coins! 2. The 9999HP Geno trick works on Exor after an eye is taken out!!! 1. In the area where there's a big gap with two blocks that take you halfway each, jump down. You'll find a Mushroom and 1 FP!